You put two things together that have not been put together before. And the world is changed. People may not notice at the time, but that doesn’t matter. The world has been changed nonetheless. 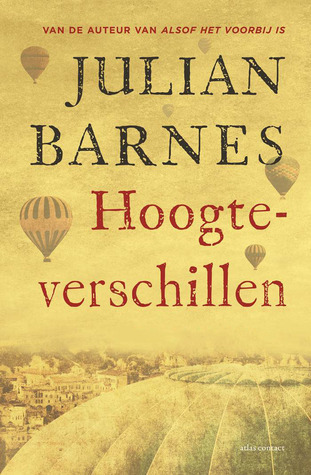 With these beautiful words Julian Barnes leads us into Levels of Life, his latest work. He begins with glimpses at the history of balloon aeronautics—when the act was still considered a magical one by most people’s standards—and some of the pairings it produced that might have gone unnoticed. In the first section we meet Englishman Fred Burnaby and the Frenchman known as Nadar, both pioneers in ballooning. Nadar combined aeronautics with his love of photography, taking some of the first pictures of the earth from the sky. In the second section the book takes a whimsical turn with Burnaby meeting and falling in love with French actress Sarah Bernhardt, another ballooning enthusiast. It is the final section of Levels of Life that brings the book back down to earth and even belowground. Using the Greek myth of Orpheus and Eurydice, Barnes shares his grief over the loss of his wife of thirty years. The intelligence and elegance of his prose does not negate the raw power of his pain. For such a small book the pages are heavy with emotion. Reading Levels of Life is a bit like ballooning in that there is a feeling of letting go and floating. It is not clear where Barnes is heading when the book begins, and as it moves from a factual, historical perspective into a more fictional one the reader has to let go of preconceived notions of how a novel/memoir/essay should be constructed. It is only as Barnes gets personal that what seems to be directionless descends into the land of heartache and sorrow. What was light and flighty is now gone and the journey becomes one of how best to survive the landing. Top 10 Books That Made Me Say Yum! I am totally in love with the Dutch cover for this book (https://d202m5krfqbpi5.cloudfront.net/books/1370941513l/17695198.jpg) am not sure though if it would be a read for me! Thanks for sharing your thoughts. This sounds very different. Kind of up there in the air – like a balloon? I really enjoyed The Sense of an Ending when I read it a couple of years ago. I wasn’t aware of this one, but it sounds like a great reading experience! Interesting! I just finished The Sense of an Ending the other day! It was my first JB book and I really enjoyed it. You’re the second person to mention this so I guess I need to add that to my ever-growing TBR list!